Councillors have welcomed plans for Oyster pay-as-you-go to be accepted on the Putney to Blackfriars riverbus service by the end of the year. The move is designed to make it easier and cheaper for people to travel to work on the river and to ease the pressure on the rest of the transport network. Currently the Putney service carries about 15,000 passengers per year but with proper investment this could rise to well above 350,000. The council is using its planning powers to encourage riverside developers to include new passenger piers in their planning applications. New piers are now proposed at Wandsworth Bridge, Battersea Power Station and just across the border with Lambeth by Vauxhall Bridge. Wandsworth is part of the capital’s River Concordat Group which was formed last year to help integrate and develop the capital’s river transport network. 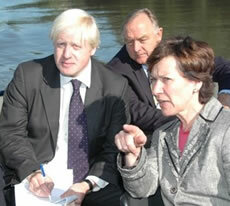 It includes riverside councils, boat operators, pier owners, the mayor’s transport advisor and Transport for London (TfL). Over the past year the group has created a common timetable format and an improved riverbus services map. This has made it much easier for people to understand service information and plan their journeys. Other steps include introducing Oyster pay-as-you-go on Thames Clippers routes in central London which has paved the way for the roll out to Putney services expected later this year. Capacity, signage and passenger information on improvements have also been introduced at several existing piers. Wandsworth Council’s transport spokesman Ravi Govindia said. “We want more of our residents to be able to take the boat to work. It’s nvironmentally friendly, a great way to experience the city and a pleasant alternative to cars, buses, tubes or trains. Negotiations are now underway between the Olympic Delivery Authority and boat operating companies on increasing riverbus services during the 2012 Games. This could deliver a legacy of infrastructure upgrades and help introduce more Londoners to the benefits of river transport. Wandsworth has a longer stretch of riverside than any other London borough and a long established rowing and sailing tradition. A report on the progress of the river concordant group was presented to the council’s strategic planning and transportation overview and scrutiny committee on January 18. The full paper in available to download online. 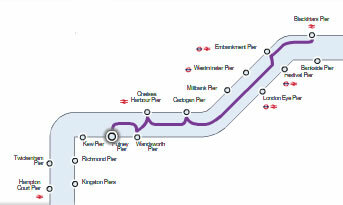 For more information on London’s river services including timetables and maps visit www.tfl.gov.uk/river.